The City of Lake Geneva Avian Committee has a colony of new Purple Martin Houses. If you are interested in volunteering to be a nest-keeper, please sign up (below) to come to our Introduction and Training session. 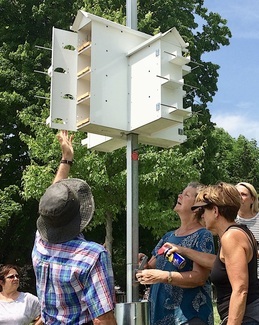 This will be a one-hour hands-on demonstration of how the Purple Martin houses operate and what volunteers do to check in on the nests, eggs, and birds. Thursday, April 18, 2019 from 1:00 to 2:00 pm. Wear appropriate outdoor clothing. We will be working outside at the houses. If we need to reschedule due to bad weather, we will use the sign-up sheet to send you a notice. If you are interested in volunteering but cannot attend this session, please write a comment in the RSVP section. We will review the "job description" for nest keepers at the training. However, in general, volunteers are needed who can check the nest boxes in the houses for nests, hatchings, and the general welfare of the birds. Volunteers will be asked to visit the houses a couple of times a week during the heat of the day, crank down the houses and check on the nests, and report key events. I’m super interested! I would be available to learn on the weekends.